Jewel D. Flores, 65, of Western Ave., Random Lake died unexpectedly Tuesday, May 8, 2007 at St. Luke’s Medical Center, Milwaukee. She was born on November 18, 1941 in Potter, Arkansas, daughter of William Burl and Nellie Lee McCravans Bledsoe. She moved to Port Washington in 1951, later living in Milwaukee for many years before moving to Burlington and finally to Random Lake in the early 1990’s. Over the years she had worked for Briggs & Stratton Mfg. Company in Milwaukee, Walmart in Saukville and a Certified Nursing Asst. (CNA) at various facilities. 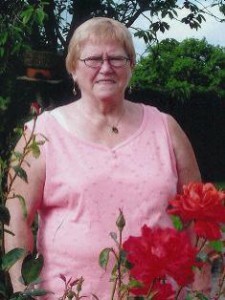 Primarily she was a caregiver to her family. Her door and her heart were always open. She raised her children, grandchildren and great-grandchildren when the need was there. She was active in her church by teaching CRE, being a eucharistic minister and openly sharing her faith with others. She loved flowers and tending to her garden. She had just traveled to Ireland and Oregon with some of her family and had a truly wonderful time. She is survived by two daughters, Maria Flores of Milwaukee and Martha Baker of Belgium, her son Thomas Flores of Random Lake, her grandchildren whom she raised Jesse, Kristine, Amanda, Simon and Martin with Alyssa, Donna, Jessica, Cheyanne, Erica and Angela and her twelve great-grandchildren Evangelina, Cesar, Sergio, Joshua, Jr., Brett, Traylor, Jesse Jr., Damian, Autumn, Zoe, Austin and Kayla; four sisters Billie Jean McGinnis of Hales Corners, Ruby (Gene) Arendt of the Town of Port Washington, Linda (Orland) Miller of Henderson, CO and Brenda (Dave) Barnekow of Frostproof, FL, her brothers Wylie (Jean) Bledsoe of Dubuque, IA and Chuck (Linda) Bledsoe of Cedarburg, nieces, nephews, other relatives and friends. She is preceded in death by her daughter Mary Sorce, brothers James and Willie Bledsoe and a nephew Bobby Bledsoe. A Mass of Christian Burial will be celebrated at 7:30PM Monday May 14, 2007 at Our Lady of the Lakes Catholic Church, Random Lake. The Reverend Jim Vojtik will be the celebrant. Interment will take place in the Union Cemetery, Port Washington. Visitation will be from 4-6:45PM Monday at the Poole Funeral Home, Port Washington. IA memorial fund has been established in her name.